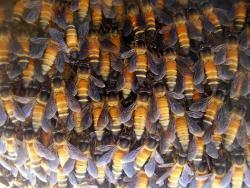 Honey bee population mysteries... is a new virus to blame? 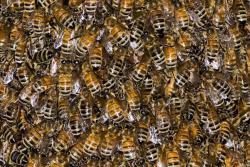 Bees: Another new virus, similar to HIV, has been identified as being a possible cause to high numbers of honey bee deaths.Courtesy BksimonbThere's a new possible factor to the rapid collapse of honey bee population numbers. And tobacco plays a role; but the impacted bees aren't smoking. New research shows that a rapidly mutating plant virus, called the tobacco ringspot virus (TRSV), may be at play in the high fatality rates in bee population numbers. This new virus behaves very similarly to the HIV virus in that it rapidly mutates to evade the immune systems of the honey bees. Evidence of TRSV has been showing up in many dead honeybees. It's one new piece of the puzzle researchers trying to solve this mystery now can look at. Other factors that appear to be killing honey bees at high rates are new agricultural pesticides, a specific species of mites, the Israeli paralytic virus (IASV) and the loss of open wilderness. 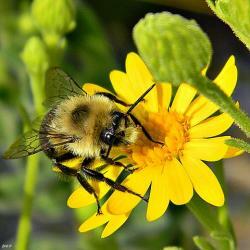 Last winter, one third of honey bees died, a 42-percent increase over the regular winter death rates of 10-15 percent. What do you think of this new theory? Share your thoughts by leaving a comment here for other Science Buzz readers. Researchers at the University of South Florida recently found that the fungicide chlorothalonil, in the same family as DDT, killed almost 90% of the frogs exposed to it. They tested several species of frogs, and all had the same reaction. 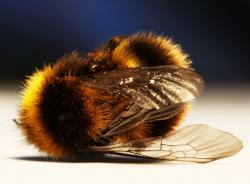 They are now testing the chemical's mortality rate for other organisms, including bees. Delicious nectar...Courtesy flickrIt feels like summer is finally here, and with the warm weather comes swimming at the beach, picnics, and… bumblebees. To test her initial hypothesis, Dr. Glover and her team created artificial flowers out of epoxy resin, half with flat cells and half with conical-like cells. When the petals were horizontal there was no preference, but as soon as the angle steepened, the bees chose the conical cells more than 60% of the time. Real flowers were also tested, this time the bees preferred the spiky surface over 75% of the time. Using high-speed video photography, the team saw that when bees attempted to land on the flat-celled petals, they struggled for grip. However, in all recorded occurrences the bees were able to grip onto the conical cells, allowing them to stop beating their wings and rest while feeding. So next time when you see a bee sucking nectar from a flower, impress your friends with your knowledge of conical shaped cells and bumblebees! Marjorie Bolz Allen was a lifelong museum volunteer at the Science Museum of Minnesota. In her memory a Marjorie Bolz Allen Grant is awarded to a SMM volunteer to develop an activity that will directly enhance our museum visitors' experience about a science, technology, engineering or mathematical (STEM) discipline. I hope the following links will help my fellow volunteer (A.Z.) in developing her activity about bees. The Mid-Atlantic Apiculture Research Extension Consortium (MAAREC) has links to press releases, research updates, and articles about CCD. The University of Florida's Institute of Food and Agricultural Sciences (UF/IFAS) also has a web page with links to related sites and articles about colony collapse disorder. An April 16 Ars Technica article titled "A cure for colony collapse" claims that "new research has proposed both a concrete cause for bee colony collapse disorder, as well as a cure". The abstract of the source paper titled, "Honeybee colony collapse due to Nosema ceranae in professional apiaries"
Joe did a Buzz burst April 8 titled More on the vanishing bees and linked to a great article in Scientific American titled Solving the Mystery of the Vanishing Bees"
Click this link for all Science Buzz posts about bees.